Hope you are all well and that you had a great holiday period and that you started the new year with positive things! I’m not happy to say that I started my year stranded at the party place by the taxi we’d booked, but that’s another story! Back to this post though 🙂 I had gone to a clothes shop last year and saw a particular dress which immediately flipped a switch inside my brain saying: “I could make that! And a better one at that!” So, I took a couple of sneaky photos of this dress to keep the image fresh in my mind and set off on the adventure of creating my first ever pattern – this was both easy and difficult (I will tell you why in a different blog post). I bought the wool (a 400g ball of Aran) and for the first time ever, I did the gauge! SHOCKER! 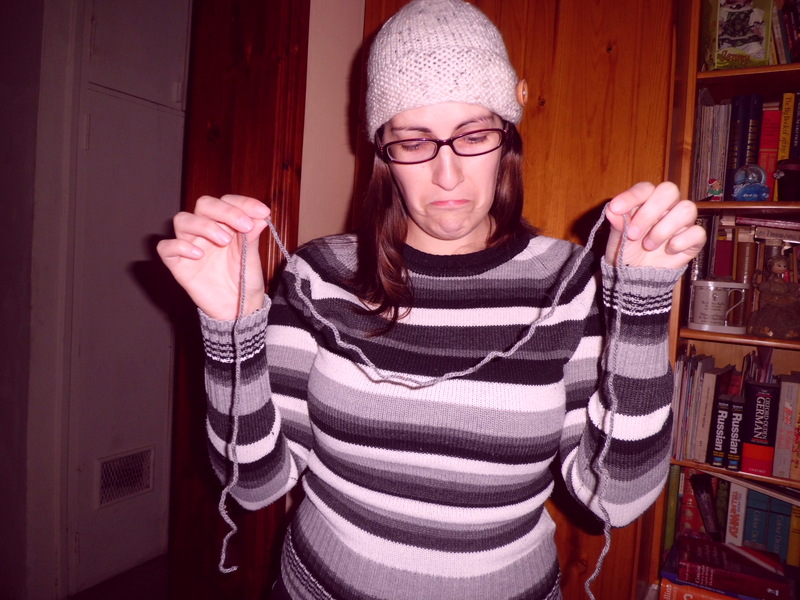 I know most of us knitters don’t even bother with the gauge (at least, I’m assuming this is so) but this time, I actually needed to be sure about the gauge in order to create the pattern for my body size. 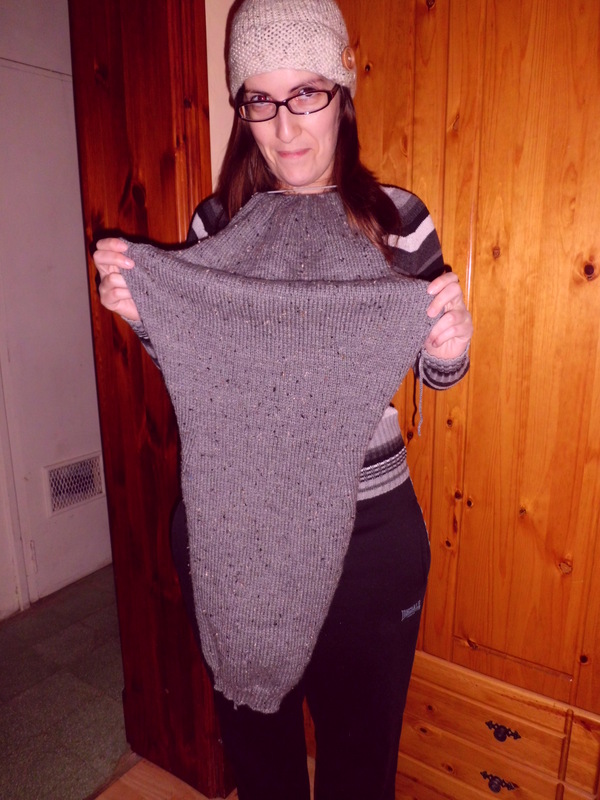 After I’d created most of it, I began knitting the back and when I finished that, I started on the front. I thought I would get to about the waist of the front but the wool kept going and going. So I’m estimating that this dress will take about 500g of wool to make, in total. I wasn’t worried about the yarn finishing because last week, I’d ordered another one. Last night, I actually got to the first shoulder strap! Exciting! 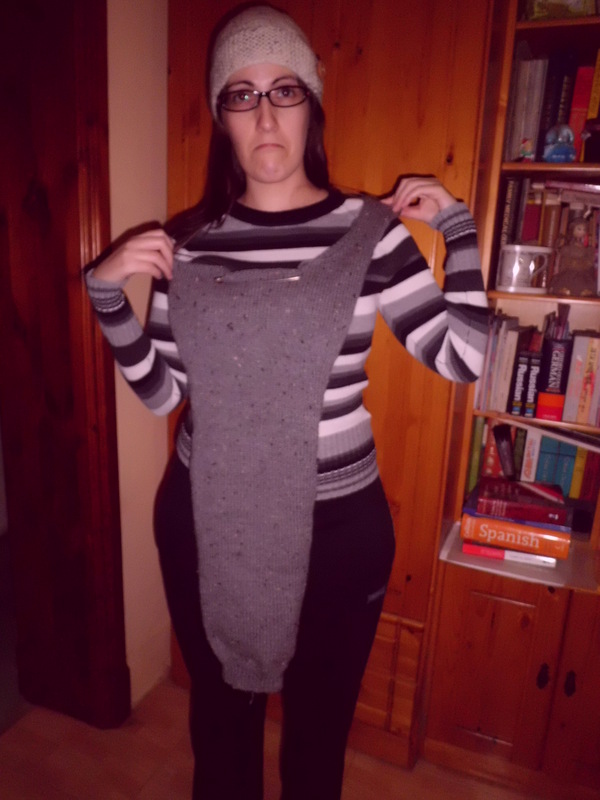 Imagine my disappointment – I feel so gutted that I can’t continue this dress…all that’s left is the other shoulder strap, the sleeves (which will be short) and the cowl neck. Some of you might feel my reaction is over the top but for me knitting is my method of getting away from it all, it relaxes me and I sometimes even vent my feelings into the work. It’s definitely one of my outlets and I can’t believe how long I’d left it before I picked it up again!